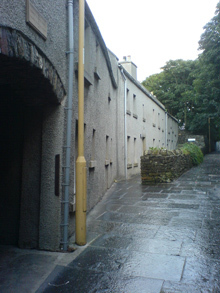 The Society was founded in 1968 when Laura Grimond organised a lecture to campaign against the demolition of Papdale House (left). 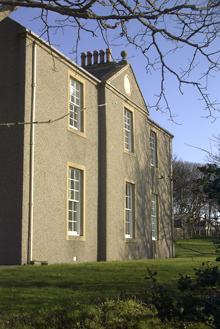 Some years later Lady Grimond, using a bequest from her mother, purchased property in The Strynd (below): this is managed by The Orkney Heritage Property Trust on which the Society is represented. The Society operates according to a constitution that may be consulted by clicking here. The business of the Society is conducted by an executive committee of about a dozen members who are elected at the Annual General Meeting in October or November. In furtherance of its objectives the Society organises public lectures, conferences and other activities, such as the annual trip to Eynhallow. In recent years the Society has organised two major conferences: on the Neolithic Age and on the Iron Age. Proceedings of these conferences have been published. The Marjorie Linklater Award for a piece of original writing by school and college students. The Fereday Prize for a local history investigation; this is open to second year school pupils. The Laura Grimond Awards for architectural projects. The Society also publishes an Annual Newsletter and, on a more irregular basis, The New Orkney Antiquarian Journal. Through a subcommittee, the Society regularly comments on Planning Applications made to Orkney Islands Council, particularly for Listed Buildings and within Conservation Areas. The Society is represented on the Orkney Countryside Committee and contributes to the Orkney Community Plan. The Society has also provided support to projects consistent with its purposes and has played a role in the setting up of other organisations, particularly in their early stages, including the Orkney Archaeology Society (formerly the Orkney Archaeological Trust) and Westray Heritage Trust. Membership is open to the public on payment of an annual subscription: life membership is also available.